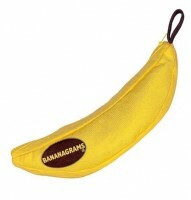 We have played the real game of Bananagrams just a handful of times and that’s it. Like Scrabble, it’s just not something my family *ahem* wants to play with me. Take a word, spell it, scramble it, give it to someone else at the table. Let them unscramble it. These tiles are *much* better than Scrabble tiles for this purpose. They are thicker and easier to handle and there are way more of them, so you can normally find what you need. Also this scramble game balances skill very well. I can give my 9 year old “ARLCE,” my 12 year old “OMICTA,” and they can give me whatever they want and everybody’s happy. I’m sure there are many other word games you can play with these tiles – converting one word to another, one letter at a time comes to mind – but this one is absolutely a family favorite. When first flipping over tiles take a second to note the difficult letters and try to use them first. If you get stuck with nothing loose near the end of a round but a ‘Z’ or a ‘Q’ you will either have to break up some words or do some peeling/dumping which can be more than a little frustrating. Remember that this game is all about who can use all their tiles first, not who makes the best words. I have a friend I’ve played with several times, and he always gets too invested in making good words instead of focusing on using the tiles as fast as possible. Of course, if you can make the best, most complex words faster than anyone can make their words (complex or otherwise), then go for it, but just don’t make that a priority over being the first to finish. The first time I played was with a group of 5 seasoned Bananagramers and I hated every second. The games went by so fast and I was left confused and annoyed. I suggest if you have new players coming to the game to give them a chance to play a couple games by themselves or with one moderator so they can get a feel for the frantic game play without experienced players running over them! My wife and I got our own set so we could learn together and the next time I met up with those friends, it was a much better experience. Make a point of dumping tiles to one place and drawing from another, that way you won’t get stuck with the ‘Z’ you just drew three tiles to get rid of a minute ago. After we finish a game, my fiance and I enjoy making silly one or two paragraph stories out of our bananagram boards. Simply use all of your own banagram words and as few additional words as possible. Compete for the funniest, or most interesting story! A rule we sometimes play with, to make getting rid of that last tile a little bit harder, is to not allow two letter words. This lengthens the game slightly, but provides a new challenge and helps alleviate the insta-win scenario when someone’s last tile of the game is easily played as part of a two letter word. This can give other players a few seconds to catch up. Don’t create a small, dense crossword. Sprawl as much as you can! It’ll make it easier to fit in new tiles later on.